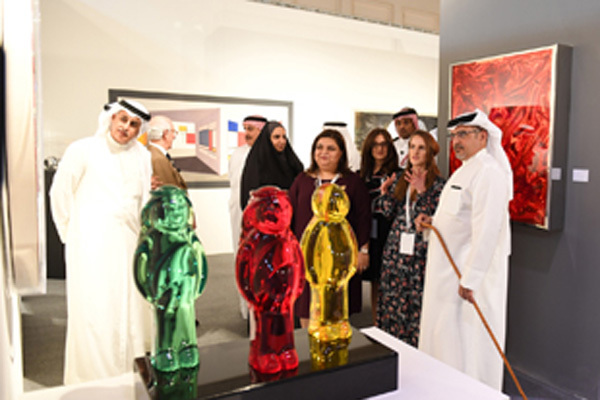 HRH Prince Salman bin Hamad Al Khalifa, the Crown Prince, Deputy Supreme Commander and First Deputy Prime Minister, yesterday inaugurated the third edition of Art Bahrain Across Borders (ArtBAB 2018), the kingdom’s foremost international art fair, said a report. Held under the patronage of HRH Princess Sabeeka bint Ibrahim Al Khalifa, wife of HM King Hamad and President of the Supreme Council for Women (SCW), ArtBAB 2018 is open to the public from March 15 to 18 and will host 15 galleries and 13 independent artists from 11 countries, said a report in BNA. While attending the fair, HRH the Crown Prince noted the extensive development the arts and cultural sector has witnessed under the leadership of HM King Hamad, and highlighted the important role the arts have played in the kingdom's history and cultural heritage. The contemporary art fair, which is the flagship project of the ArtBahrain across Borders movement, is a collaborative venture with Tamkeen and since its launch in 2016, it has created a new international trajectory for Bahraini artists around the world, with exhibitions in the UK, New Delhi and Mumbai, the report said. ArtBAB aims to strengthen the base of Bahraini artists’ visibility by empowering and educating local artists, giving them the opportunity to showcase their unique skills through a sponsored Pavilion which will this year host more than 35 Bahraini artists, exhibiting over 100 works. “The most exciting thing about ArtBAB is that it has consistently offered a new narrative on how one understands modern Bahrain. Seen through the interpretative art of its finest artists and most creative mind, one gets to experience a new Bahrain where an ancient heritage is decoded and brilliantly put together on canvas and through sculptures,” said ArtBAB Fair and Programme director, Kaneka Subberwal. Notable international participants include Alon Zakaim Fine Art from the UK, the Samara Art Gallery from India, Teshk Art Gallery from Ukraine, Galerie Bruno Massa from the USA, Italian artistic collective Antonello Ghezzi, and many more. ArtBAB represents an important milestone in efforts to solidify Bahrain’s position as a regional arts and education hub, while stimulating investment and economic activity in the arts and cultural sector, it said.